The Alameda County Community Food Bank is committed to assuring all residents—especially those most vulnerable to hunger—access to nourishing meals and nutrition information. 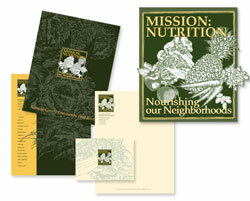 The Mission: Nutrition campaign identity must connect people to the purpose of the Food Bank and a growing community need. Letterhead, note cards, and an information packet provide the tools for a meaningful communication with a special donor base. Photographs often tell the hidden story of families whose circumstances force them to live on the streets or under conditions of stark poverty. 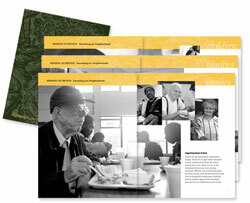 Compelling photos connect the reader to the universal satisfaction of a good meal. Facts and statistics confirm a growing community need for nourishing meals —especially by children, families, and senior citizens. 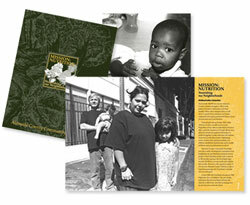 Mission: Nutrition relays the simple but dramatic story of how the Alameda County Community Food Bank meets this need with successful efficiency. An invitation to participate in the operative success of the Alameda County Community Food Bank is key to maintaining a visionary and committed donor base. 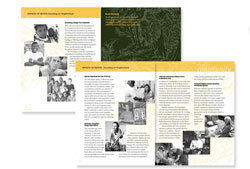 The Mission:Nutrition campaign brochure summarizes the need and the Food Bank response. Capital funding for the Food Bank's facilities is understood as an investment opportunity in the health and wellness of the whole community.